Your next outdoor adventure is ahead of you! Stay warm and dry out there with the Wheeler Lake Sleeping Bag made by Slumberjack! Let’s break it down. The Wheeler series bag comes in three different sleeping bag styles. These include the -20 degree, 0 and 20 degrees sleeping bags. Each developed for your style of packing. With the full Slumberloft Synthetic Insulation and its seam layering design, you can forget about any cold nights that might be ahead of you. A “Toes-Up” feature at the base of the bag give more room for you to move your feet and enhance the comfort of your packing experience! An additional feature has been added to the Wheeler series bags. 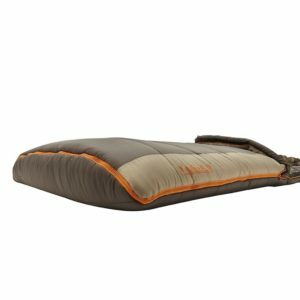 This feature includes a unique 2 in 1 zippered hood that provides a platform in which you can sleep with a pillow as well as help you to close up or keep open the top component of your sleeping bag. Further, the Wheeler series bag also includes a non-catch zipper that allows you to easily access the sleeping bag at any time! This bag is perfect for any trip you may embark on. To learn more about the Wheeler series bags and Slumberjack click here!